touch, the leading mobile telecommunications and data operator in Lebanon, managed by Zain Group, has performed the first commercial 5G trial in Lebanon using Huawei equipment, at an event held under the auspices of the Prime Minister Designate Saad Hariri represented by the Caretaker Minister of Telecommunications Jamal Jarrah. This trial showcased the real 5G experience that customers shall have once it is deployed in the country and 5G-enabled devices become available. 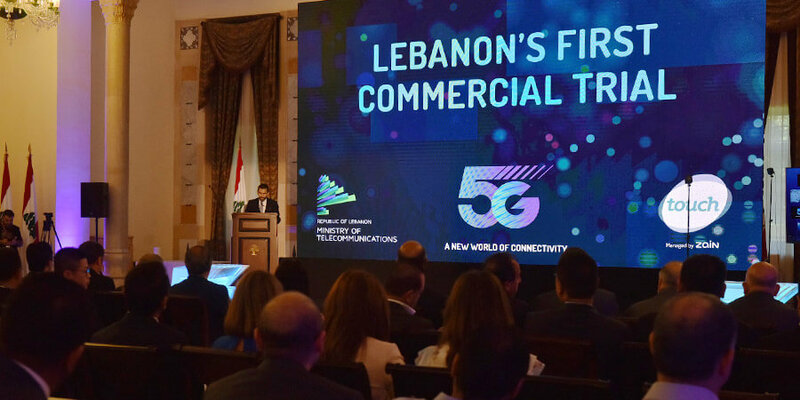 During the trial, touch Chief Executive Officer Emre Gurkan announced that the first commercial 5G site in Lebanon will be installed at touch’s new location in Down Town Beirut. This state-of-the-art 5G site will act as an incubator for and bolster the country’s digital startup ecosystem, aiming to have a significant trickle-down effect enabling a range of new innovators to deliver compelling services. Minister Jarrah addressed the audience at the Grand Serail and said: "At the Ministry of Telecommunications, we are determined to modernize the existing infrastructure to accommodate the latest technology advancements. So we began to deploy fiber optics across Lebanon, to benefit the Lebanese citizens with modern technology, in addition to expanding mobile networks to keep up with developments." He continued, "We are now in the 4G phase and very soon, with the rapid technological advancement, we will enter the 5G world that will lead to significant progress in the economy, ranging from industries within trade, tourism, agriculture, medicine, and education sectors." Jarrah pointed out that "touch’s 5G trial is the first and most importantly, it will soon be available commercially to industries, institutions, and governments alike. Simultaneously, this new technology will contribute to providing numerous jobs to the youth". Commenting on the successful 5G trial, touch CEO Emre Gurkan said, "This is a momentous milestone for touch given our stated goal to innovate for the betterment of the customers we serve, and to improve the quality of life for all in Lebanon. This trial gives a fantastic preview of the truly awesome power this technology possesses and the incredible services and applications it will drive." Gurkan continued, "I would like to express our sincere appreciation to the Prime Minister, His Excellency Saad Hariri, and His Excellency Minister of Telecommunications Jamal Jarrah for their role in driving technology innovation in Lebanon forward. Together we shall make 5G technology a commercial reality to the benefit of government entities, private businesses and individuals alike." touch currently benefits from the expertise of Zain Group in the area of 5G, given that several of its operating companies are planning to launch 5G in due course, and are innovating accordingly. Zain has successfully tested 5G technology in Kuwait achieving maximum throughput speeds of over 70 Giga Bit per Second (Gbps) over 2GHz spectrum. This speed represents one of the highest-ever recorded in the region, placing Zain at the forefront of 5G innovation for the benefit of its consumer and enterprise customers.